What if there were a way for the public and private sectors to meet in the middle, equally contribute to project funding, and agree on flexible building standards, creating lasting change—for the better—in the U.S. commercial building industry? Does that seem about as likely as, say, achieving world peace? Think again. The National Institute of Building Sciences (NIBS), established by the U.S. Congress in 1974 as a liaison between government agencies and private industry, fosters just that sort of successful collaboration. In both public and private facility design, there has long been a lack of standard specifications for every aspect of the building process. NIBS recognized this need and developed a unique, collaborative way to address it. The institute is taking the lead in bringing together representatives from government agencies and private industry—from the most knowledgeable groups in each segment of the building process—to create a Web-based Whole Building Design Guide (WBDG). The guide, available at www.wbdg.com, focuses on providing specifications that anyone—from the newest entry-level employee to the seasoned professional—can turn to for guidance. It is an ambitious project, grown from the realization that there is a pressing need for an authoritative resource on building sciences and the latest technologies. The goal is for the WBDG to become the primary communication vehicle for building-design professionals. The guide is both supported and maintained by NIBS. The WBDG covers a broad range of topics, but as yet there is no significant information included in it that specifically relates to mechanical insulation. While there are several sources for mechanical insulation specifications, none combines all of the best knowledge in one easy-to-access place. Therefore, NIBS formed the National Mechanical Insulation Committee (NMIC) For Building and Industrial Applications to focus on compiling and approving a Mechanical Insulation Design Guide (MIDG), which will be part of the WBDG. This information will appear as a link on the WBDG website. With one click, end users will be able to access the most important information to aid in decision making for mechanical insulation. “There’s a lot of information on mechanical insulation available, but it’s dispersed in handbooks and documents that aren’t readily available. The committee felt it would be useful to develop a process to take information that has been reviewed by a number of people and organizations in the industry and agreed upon on a consensus basis, and put it up on this website,” explains Chris Crall, P.E., an industry consultant to the NMIC and a mechanical engineer. To develop the MIDG, the NMIC is working with the National Insulation Association (NIA); the American Society of Heating, Refrigerating, and Air-Conditioning Engineers, Inc. (ASHRAE); ARCOM (Masterspec®); the Midwest Insulation Contractors Association (MICA); and Process Industry Practices (PIP). Each of these organizations has valuable technical information available in various forms. The design guide will compile information available from each group and present it to end users as a single reference point for mechanical insulation specifications. The NMIC’s objective is to complete the guide and make it available online by the end of the first quarter 2007. The MIDG will include important information and even more valuable online tools. Many building designers are unaware of the various insulation products on the market. For example, currently there is no one place that refers them to different manufacturers’ websites and product information. The MIDG will allow manufacturers to post submittal sheets for their products. Once approved by the NMIC, a link to the manufacturer’s site will be posted online. These four sections contain a good summary of existing information about mechanical insulation, and they also provide a convenient way to organize the additional efforts required for the MIDG. It is understood that different individual and organizational contributors will have expertise in each of these areas. For example, it is envisioned that insulation and accessory material suppliers will contribute significantly to the Materials and Systems section while insulation contractors will be primary contributors to the Installation section. 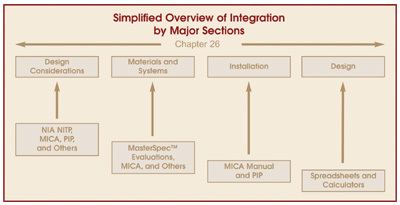 See “Simplified Overview of Integration by Major Sections” below. Establish a team. Four or five reviewers with expertise in the subject matter for each area will form a team. Team members will be recruited from the NMIC and other supporting organizations (such as NIA, MICA, or ARCOM) and preferably would be people who were not involved with the development of the original source document. They will, however, demonstrate that they have the appropriate experience to contribute to the task. Perform an initial review. The original document will be circulated among each section’s team members, who will review the material, make comments, and suggest additional information to be included in the MIDG. Rewrite the material. This process merges the existing text with new data, based on the comments and suggestions from the initial review step. Complete a final review of the material. The rewritten text will be circulated to the entire NMIC for final review. This will be the last opportunity to make comments and suggestions to improve the section’s content. Finalize each section. All input will be considered, each section will be finalized, and the completed sections will be posted on the WBDG website. Each section of the MIDG will require a specific approach, based on the necessary individual subtasks needed to complete the section. For example, in Design Considerations, information from NIA’s NITP will be reviewed and possibly integrated into the section. The topic of sustainability also will be addressed, and the Leadership Energy and Environment Design (LEED) Green Building Rating System™ and other similar initiatives will be covered to give insulation end users a broad range of valuable information. The development of the MIDG is a unique initiative. It is funded 50 percent by government agencies and 50 percent by private industry (NIA’s Foundation for Education, Training, and Industry Advancement). NIBS works with such key government agencies as the Army Corps of Engineers (COE), the Federal Energy Management Program (FEMP), and the General Services Administration (GSA). This extensive cooperation between government agencies and private industry is a major victory. The U.S. government has a huge stake in NIBS’ efforts—it’s the largest employer in the United States and the biggest user of building space. easy-to-access, single reference point for all their building-design needs. The WBDG is a successful collaboration that provides this much-needed resource, making it a true win-win situation and a coup for the commercial building industry as a whole.